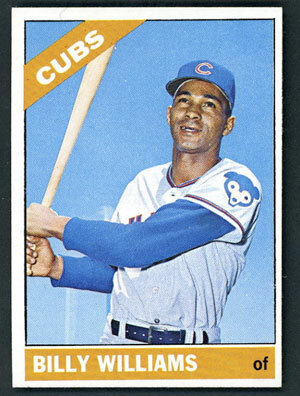 1966 Topps Billy Williams #580 is one of the best-looking baseball cards I have ever seen. It features a quintessential baseball waist-up after-swing pose. The 27-year old Billy Williams is wearing the elegantly classic Cubs Away uniform grays of the 1960s. The simple and iconic vintage Cubs emblem is fully featured on the sleeve. The full blue sleeves help give the color blue a strong presence on the card coupled with the timeless Cubs hat. Those blues nestled with the neutral gray uniform are set nicely against an all-blue sky that fades so gracefully from top to bottom. I argue that the soft white vertical lines in the lower left give a youthful vibrancy; for those shapes are light towers from a spring training facility. The excitement of a new season is symbolized by these subtle forms. The smile on Sweet Swingin’ Billy’s face is joyful, yet professional. His skyward glance is optimistic and inspiring. The 1966 Topps set is well-known for its pleasing design purity. The player name is simply displayed as all caps in a bold sans serif left justified in white against a colorful solid block. The player position balances right justified in a bold all lower case sans serif in black. The team name banner in the upper left receives a similar treatment, yet is angled to give a subtle gracious sense of zing. My only complaint about the design is the use of a condensed font for the player name while the team name is not condensed. I would have preferred both to be condensed. A black outline frames the photo and ties in with the black used for the player position which in turn contrasts well with the heavy white text for the player and team names. Every single element works as a team without being overbearing or trite. In the case of the 1966 Topps Williams card, the orange serves as a natural visual contrast to the strong blues found in the photo. My favorite part of the card is how the team name banner, Williams’ bat and Williams’ arms form an incredibly dynamic Z-shape. It’d be great to own this card some day. A quick look on ebay shows the card goes for $30 and up. My funds are currently better invested elsewhere, but someday I’ll get my hands on the 1966 Topps #580 card, one of the greatest baseball cards of all time. The inspiration for this blog post came today as the Billy Williams statue was unveiled at Wrigley Field. The stats on the back of the card will reveal that 1965 was a great year for this HOFer. Williams hit .315, 34 home runs, 108 RBIs, 115 runs, and he played in all 164 games. He also had an OPS of .929. Why don’t you just print out this card and hang it up? Personally I’m not a huge fan of this card. But I like the idea of this for a series. My favorite baseball card of all time is the heavy Tommy Lasorda manager card when he was with the Dodgers. He used it on his slim fast commercial. He looked so ticked off in it. Hey Ned, I tracked down that commercial with Lasorda. It turns out that it’s a photo of an angry Lasorda, not a baseball card. you’re not a huge fan of this awesome card, spud? what? you crazy? I must agree that the 1980 rickey henderson rookie card is one of all-time best. In my research for this blog post, I came across another blog that mentioned this card is commonly accepted in the industry as one of the all-time greats.